Yakhnich Motorsport team has decided to sell off Sam Lowe’s 2013 World Supersport championship-winning Yamaha YZF-R6 on eBay. Yakhnich Motorsports entered the World Supersport series just three years ago and took the World Supersport 2013 title with the 23-year old Lowes. The former 2010 British Supersport Champion from Lincoln, UK lifted the crown from 2012 WSS champion Kenan Sofuoglu. Lowes over the 11 race season (the Moscow round was cancelled following the tragic death of Andrea Antonelli) was a model of consistency winning a stunning six races, and taking five second places plus an astonishing nine pole positions. The English rider was off the podium just once, during the Aragon round , when he was caught out by technical issue while he was fighting for the victory. Lowe’s also gave Yamaha its third riders' title in five seasons, and next season he’ll be switching to Moto2 championship and racing for Luca Boscoscuro’s Speed Up team. 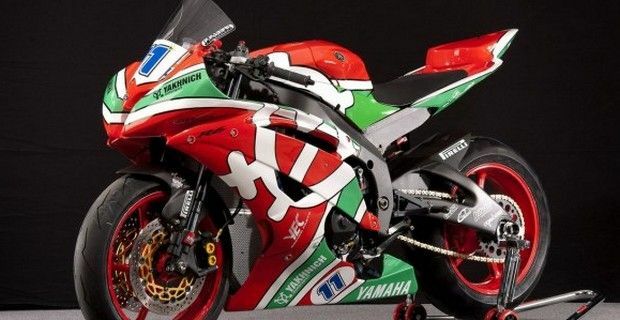 Since the Russian based team is partnering with MV Agusta in 2014, and will be fielding a F4 RR in the World Superbike championship and two F3 800s in the World Superpsport category, the sale of this highly competitive Yamaha R6 will probably go to incrementing the team’s racing budget. This fantastic sports bike according to the description on eBay has been completely revised, is in mint condition. It features the Phillip Island engine spec, so it has just 300 miles on it (480 km), has front and rear works Bitubo suspensions, Magneti Marelli electronics, Brembo/Nissin brakes and an Arrow exhaust system , carbon fiber bodywork and is accompanied by FIM technical inspection records. The machine’s selling price is currently at US $109,999 with just one day left to run, so if you’re looking for an awesome track bike with a real pedigree, this could be a great occasion.